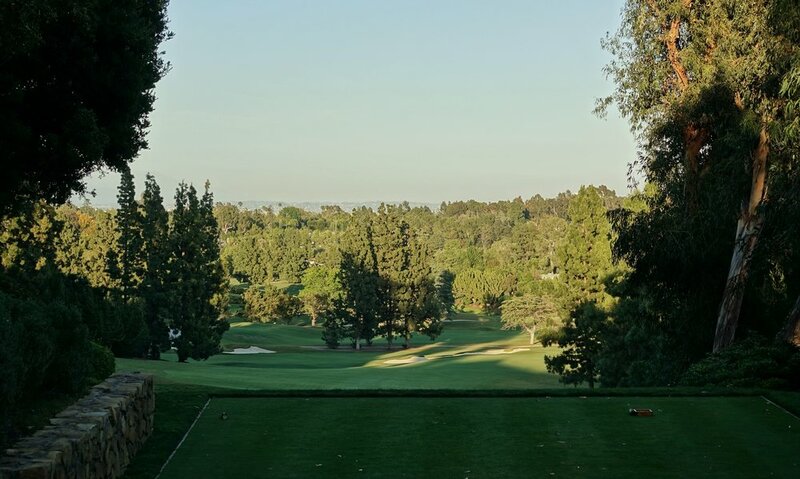 Through a good friend, I‘ve been able to play Bel-Air Country Club a great number of times. It’s one of my favorite places to spend a day golfing. One of the aspects of the club I have noticed is the positive relationship between the staff and members. It's a friendly club with great camaraderie which makes the atmosphere fun to play golf. 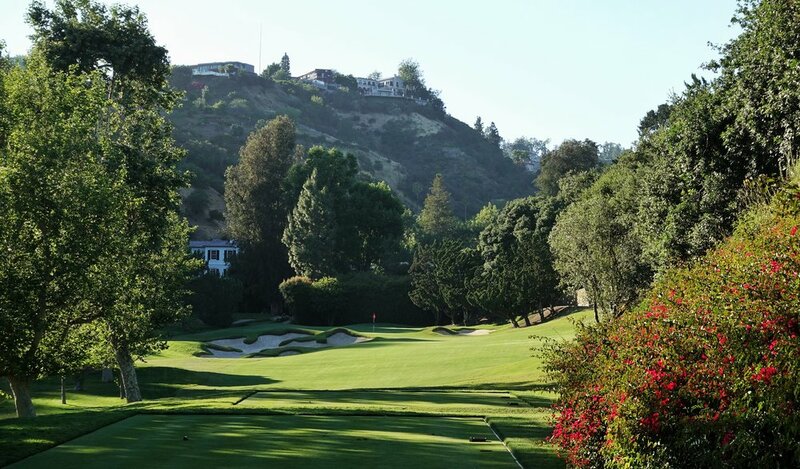 Designed in 1926 by George C. Thomas, Bel-Air Country Club joined Los Angeles Country Club and Riviera C.C. as his third design in LA. While Thomas receives copious acclaim, his partner William Bell is often overlooked. Bell was Thomas' construction guru and is one of the greatest of his time and deserves more recognition. I grew up playing a William Bell course and I recognize the similar features in the layout. 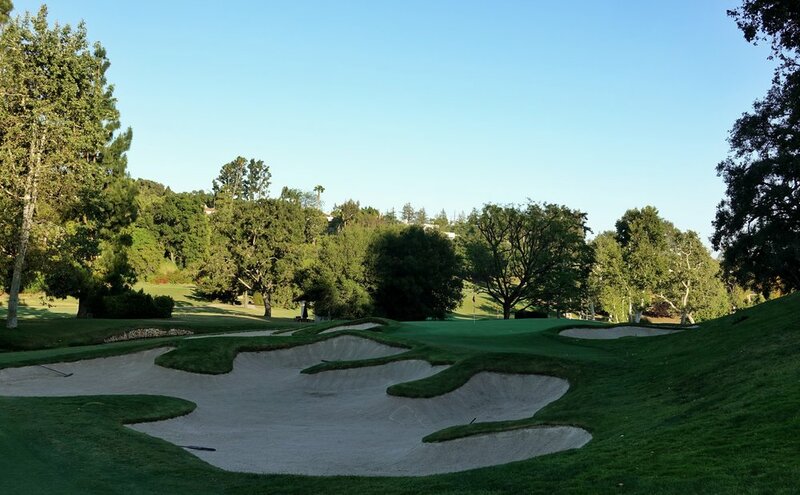 However, Bel-Air has some stark differences such as the bunkering. 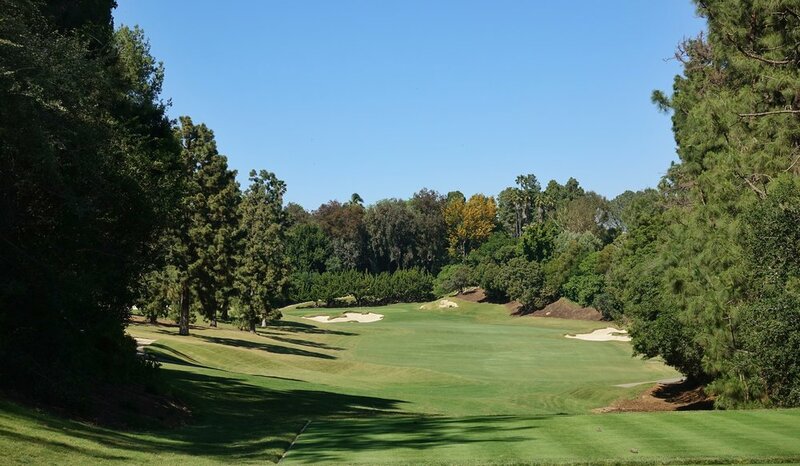 Over the years, architects such as George Fazio and Robert Trent Jones have made changes to Bel Air. The general consensus is these changes have detracted from Thomas' original design. 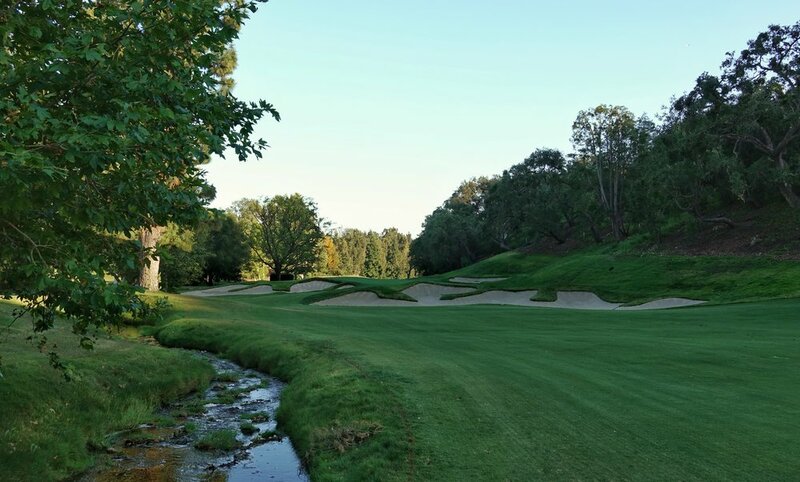 Tom Doak was asked in an interview which course he would most like to restore to which he replied Bel Air. He was awarded the job and the plan is to begin restoration work following this year's U.S. Amateur. Doak's plan is to bring back Thomas' original bunkering style. As well as removing the streams and ponds that were added over the years. Serving as a host to the stroke play portion of the 2017 U.S. 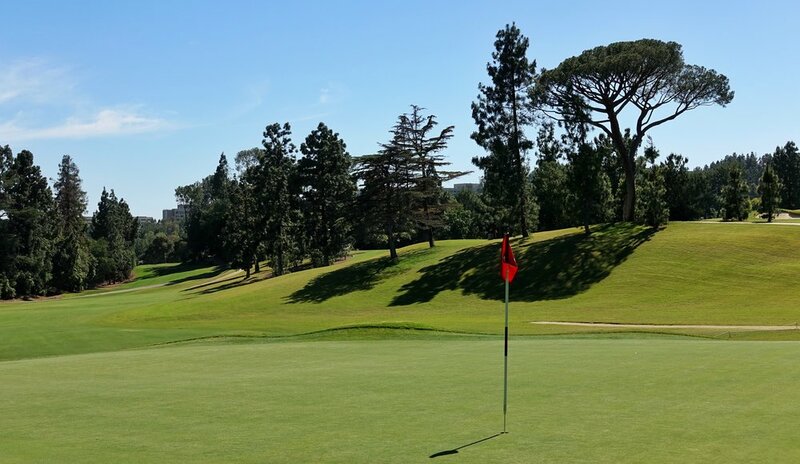 Amateur, Bel-Air will supply a great test of golf. Bel-Air weaves through some of America's most valuable property. The continued housing development leads to many criticizing the course's "cramped" feel. 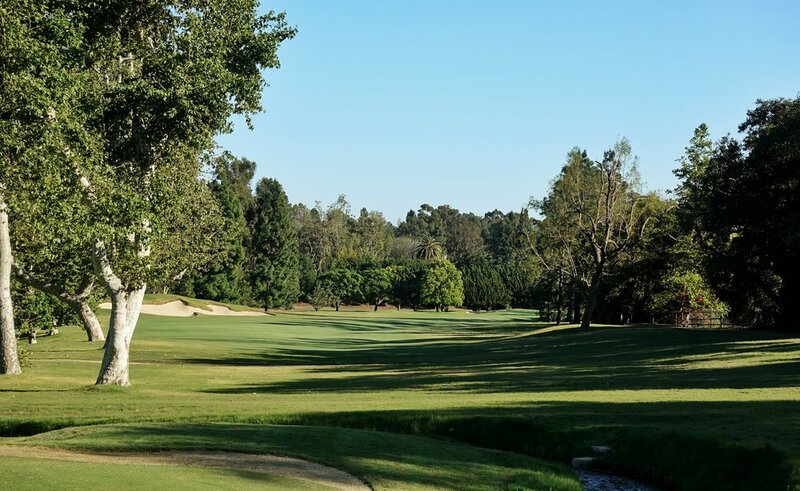 The course winds its way through beautiful canyons with million dollar mansions overlooking. Bel Air has thick Bermuda rough, a rarity on the West Coast. This places an extra premium on finding the fairway. Let's get into the holes and the unique challenges each present. Thomas' strategic bunkering creates a unique visual presence that always sticks with me. It’s one of the many reasons that the course is such a treat to play. Like the other two famous Thomas designs in the area, the first hole starts with a reachable par fve. Players tee off 100 yards above the fairway with the wonderful backdrop of the UCLA campus. It stands as one of my favorite starting holes that I’ve ever played. The hole has plenty of width off the tee, but missing more than ten yards off the fairway leads to an awkward lay up. The hole is guarded by a right fairway bunker, which is reachable but too long to carry. 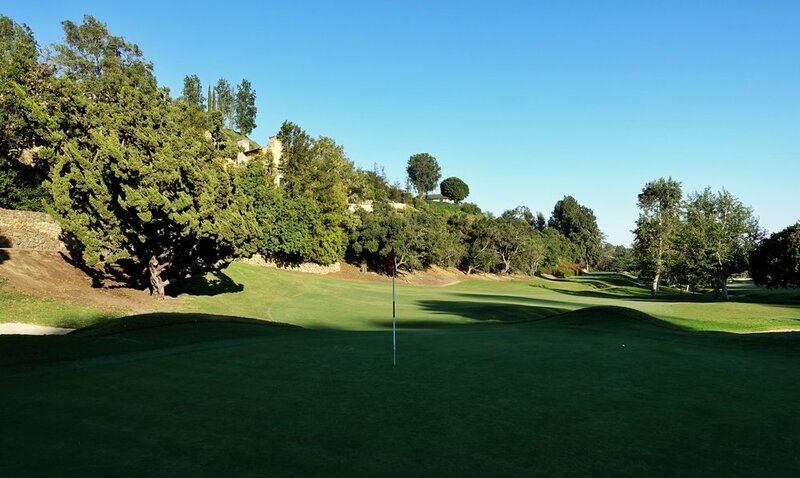 The left side has trees that block any long iron shot that tries to reach the green. A creek sits about 125 yards from the green and forces players to choose lay up or go for it. Another tree blocks the far left side of the green and a great mowed area feeds the ball to the left fringe. Right off this green is a large and deep bunker that embodies Thomas' strategic nature. The bunker punishes misses, almost always short siding players because of the narrow green. From the championship tees, the trees pinch your tee shot and require a fade to find the fairway. The ground movement creates tough lies with balls below your feet. The right side is guarded by a relatively deep bunker. A good drive yields a mid to short iron into a green which slopes back to front. The green is guarded by a deep bunker short of the green and a big boulder on the right side. One of the most photographed holes on the course, is set for a change. Doak's plan is to replace the pond to a bunker, returning the short par three to its original design. The prudent play is to aim your short iron toward the center of the green. The hardest part about this hole is judging how the wind will affect the flight from the elevated tee. This hole is another short par three which tests players patience. It begs for a draw and a good shot will reward you with a ball that rolls from right-to-left with the natural sloping. However, a miss brings nothing good. To the right, there is a deep bunker and thick rough. These shots are extra challenging because the green slopes away. A miss left yields a blind uphill chip from thick rough with the possibility of being blocked by the large tree. The walk from five to six is a memorable one. The dark, cool and cramped tunnel cuts through a canyon and provides nice relief from the sun on hot days. I always think about how much member and former NBA star Doc Rivers must loathe the walk. In my opinion, the sixth is the weakest hole on the course. It lacks creativity and challenge from the tee to the green. I think the issue is the bail out area left of the fairway off the tee. It allows players to avoid the deep fairway bunkers on the right and gives the best angle to the green. Technology has rendered the the bunker on the left insignificant, requiring only a 260 yard carry from the back tees. My hope is that Doak will be able to restore the strategy, intent and charm that it had when Thomas laid out the course. The seventh is my favorite tee shot on the course. Its ample width allows players to choose their shot shape and setup their desired approach angle. 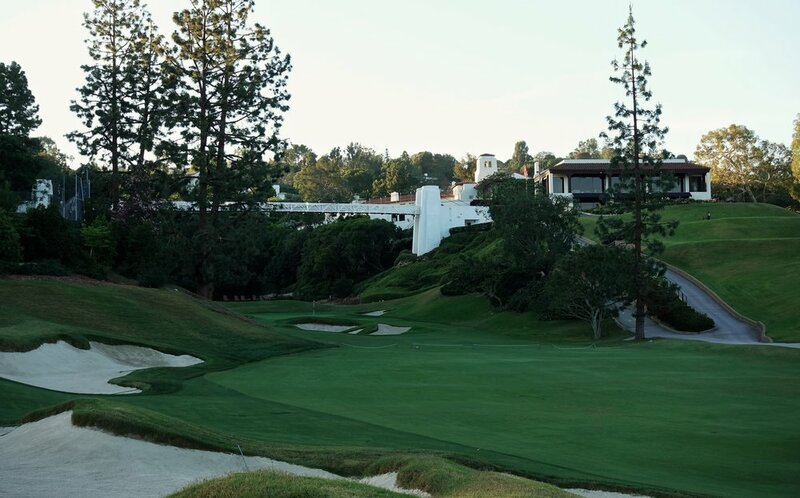 The tee shot is reminiscent of its famed neighbor LACC. The seventh's width shows the cramped nature of some of its other tee shots. 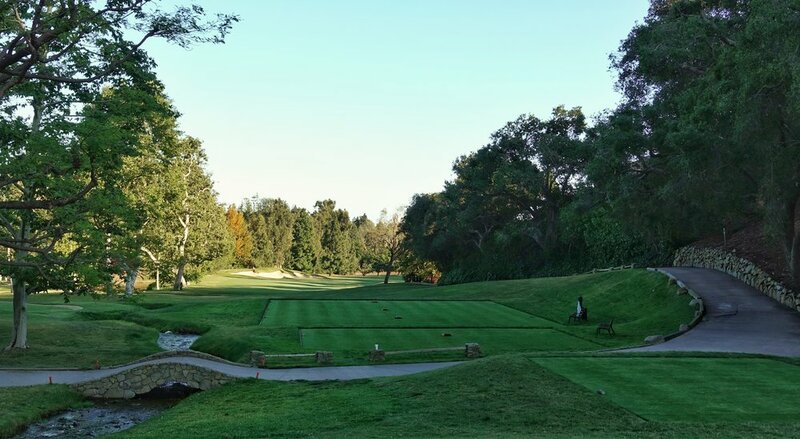 With more width in the canyons, Bel-Air could have more tee shots like seven. The green on the seventh is an example of poor renovation work. Thomas' original green has been destroyed over the years and turned into what my friend and I refer to as "putt-putt". The unnatural and severe shelves are out of place and out of character. They also make for unfair treatment to good approach shots into the hole. The short par five can stretch out to 515 yards and is one of the best holes from an architectural standpoint on the course. The fairway's natural right-to-left land movement feeds many shots into the left rough. This makes a long iron over water a risky proposition. There is a shallow bunker on the right side of the fairway that catches wayward shots. It's punishing but shallow enough to allow the heroic play and provides a great angle to attack the green in two. In the U.S. Am, I expect players to be left with a downhill long iron into the green. They will have to navigate a bunker on the right and a pond on the left. In comparing Riviera and Bel Air, I noticed a Thomas design tendency. On par five's, he loves to entice players to go for the green. He does this by creating awkward layup shots. Here, much like one and eleven at Riviera, a player has to choose between going for it or laying up to 125-150 yards. Most players will take the bait and go for the heavily protected green. 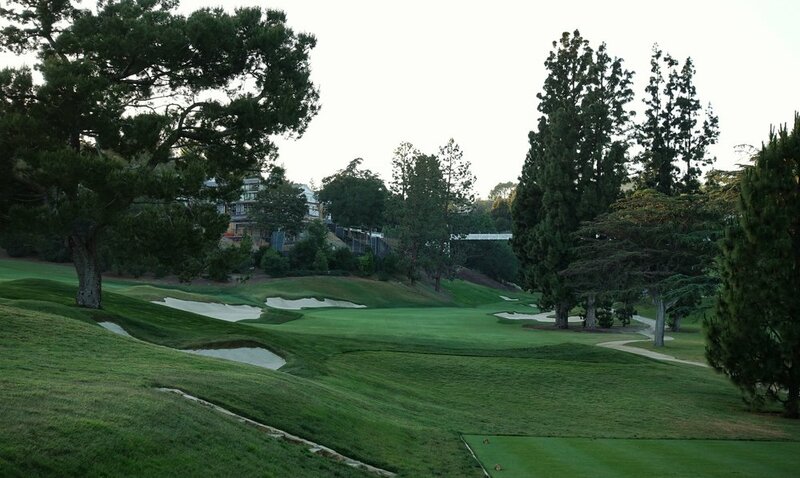 On the eighth at Bel-Air this can lead to disaster given the green’s severe front to back slope, pond and deep bunker. While laying up feels like a concession of birdie on a short par five. A new tee box was added to the ninth some 80 yards back. This tee makes a near perfect drive a requirement to close out the front nine strong. Trees pinch the fairway and a miss on either side will call for a punch shot to escape. The uphill approach to the green has two treacherous bunkers. The interesting green complex has a unique middle tier in it. With tough pin locations available, I am sure we will see this hole play over par during the U.S. Am's stroke play portion. 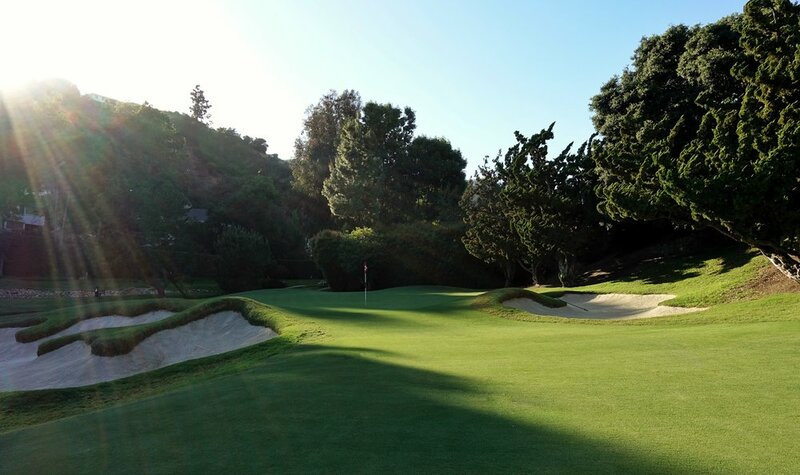 Another memorable aspect of Bel-Air is the trek to the 10th tee and the elevator ride up to the clubhouse. 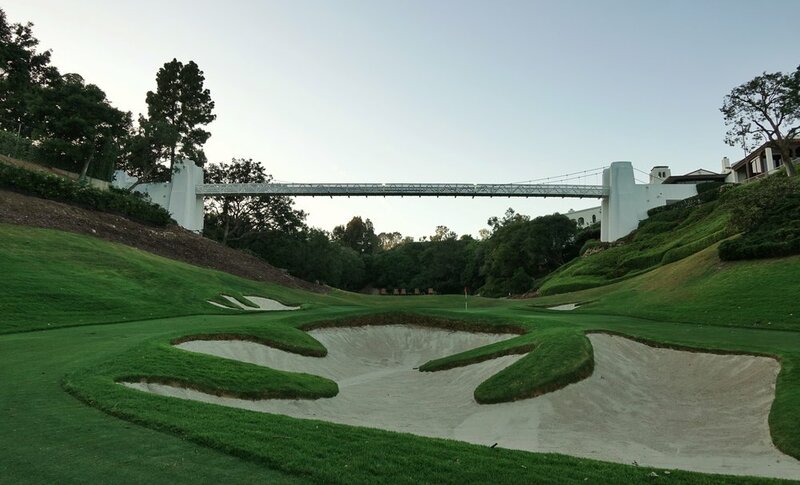 The famous Swinging Bridge at Bel-Air welcomes players to the challenging back nine. The one thing I do not dread is getting the 25% chance of starting the U.S. Am on this long, uphill, and iconic par three. The green is guarded by deep bunkers in the front, right and left. A miss long is met with deep rough on a steep bank. Finding the green is the only way to have a good shot at par on the tenth. A large tier repels many long bunker shots and the rare long iron or hybrid that lands soft. The green is sloped hard from back-to-front and can lead to near impossible putts. I have played this hole many times and I still haven't figured out the proper strategy. There are plenty of options off the tee, the safest being a long iron to a wide area short of the dogleg. An aggressive player can take on the dogleg with a hard draw. Misses right will have to deal with low hanging trees and a green fronted by bunkers. The further left you hit your drive, the better angle your approach will have. The green is deceptive and longer than it appears. This makes the back right pin the toughest to hit it close. This hole rewards a brave tee shot weaving your way between a fairway bunker and a stream left. Thomas concedes the layup short of the right fairway bunker with an extra wide fairway. The green has many great pin positions and slopes severely towards the front left corner. This great par three has ruined many good rounds of mine. When conditions are firm, any shot that lands on the green will run out to the back portion of the green. The front of the green is only ten yards wide and requires a precise shot to find it. A deep bunker guards the left side of the green, while over the bunker you will most likely find the stream. Missing long right leads to an impossible recovery due to the lack of open space. Par is always a great score on thirteen. The fourteenth is the final hole that golfers will see the stream which meanders through the back nine. With the fairway sloping to the water, the canyon comes into play off the tee. Getting home in two is tough on this hole because it typically plays into the prevailing wind. The water comes into play on the layup shot, and the closer a shot is to the water the better the angle. Weak hearted players who bail to the right will be left with a poor angle and sidehill lie. The green is sloped severely from back to front forcing a wedge shot to exercise good spin control. Out of bounds lurks to the right on this long and downhill par four. The ideal tee shot is to cut off the fairway bunker on the left. With the green sloping away from players, it's important to find the fairway. It will give players the advantage of spin for their approach to the green with their long to mid-irons. Greenside bunkers flank the front to back sloped green on either side. The final par three calls for a shot that stays below the hole. The green is fast putting from back to front. The best miss on this hole is in the right greenside bunker because of the thick Bermuda on the left. This beautiful par four doglegs 45 degrees right requiring what I call a “snap slice” off the tee. This tee shot places players in an uncomfortable spot because a three-wood can find the bunker and an iron leaves a long approach in. Strategy can be eliminated by bombing driver past the bunkers into the fairway. If tournament officials move the tees up 30 yards it allows players to challenge the bunker to gain a better angle. The giant slope right of the fairway also leaves a blind approach to the green. The approach shots yields one of the most stunning views with the backdrop of UCLA. The closing tee shot requires a fade framed by the left fairway bunker and right tree. Finding the fairway bunker yields little to no hope of reaching the green. The safer bailout is right where thick rough can lead to lost balls and tough blind approach shots. The second shot is a memorable one with the Swinging Bridge in the backdrop. A good drive will yield a short iron or wedge shot to the back to front sloped green. About the author: Owen Calvin-Smith is a Los Angeles native and soon to be Freshman at the University of Southern California. Owen enjoys golf course architecture and will be playing golf for the Trojans starting this fall. Our newsletter is the easiest way to stay up to date with golf. Sent every MWF it covers topics from pro golf to golf course architecture.